After a slow start on a Monday morning, we were finally out the door. By the time we got to Pilot Coffee Roasters, voted best new cafe 2014, it was past 11am. This might not seem like much, but it meant the difference between ordering one drink off the menu vs ordering the tasting menu. Between the two of us we tried two very different drinks. Brent had an espresso blend with steamed milk, while I opted for a single origin served as a pour over. The only thing we were missing was a coffee served using the Chemex method. But to be fair, it just looked like a fancy version of a pour over. Plus we still had to make it to Lady Marmalade for brunch. The two coffees were starkly different but both really good. You know a coffee is good if I am able to drink it black, which the single origin I ordered was. This place was my idea of heaven. So many coffees and methods to choose from and most importantly: it was all made to order. It was a fun experience as well, watching the guy make our drinks. Fueled by caffeine we made our way to Lady Marmalade for brunch. By the time we got there, there was a line out the door, it was 1pm afterall, the brunching hour. Thankfully the line moved really quickly, we did not wait more than 15 minutes. Brent asked me which table I thought we would be sitting at, not paying attention, I chose one at random… and got it right! We had looked over the menu while waiting in line so we knew what we wanted. No sooner had we sat down, we were ready to order. Turns out the AM poutine, voted best breakfast poutine (because apparently that is a thing), was sold out. We did not now that such a thing could even happen. As we waited for our food we planned out our next fooding adventure. Brent had taken the following Friday off for a bachelor party, and I would be working nearby so ti only made sense to come back again to Lady Marmalade later in the week. The ham & cheese crepe was generously stuffed, with almost too much cheese (yes, there can be a point of over-cheese). It was a ooey-goeey fun mess to eat and tasted amazing- even the baby spinach on the side. Friday morning we had to get up early, as in before 8am early. I was not having it. My head was killing me and I felt horrible. Nonetheless, the idea of breakfast poutine and some more Pilot coffee (after ordering tea, I noticed that they serve Pilot coffee at Lady Marmalade) kept me going. Surprisingly there was no line-up when we got there. I had budgeted extra time for waiting in line, so I would not be late for work after breakfast. I had overshot it by a lot. I would end up with two hours time to kill before work. The breakfast poutine was everything it promised to be: hash browns and cheese and of course Brent ordered bacon on top. The cheese was amazing. I switched back to the sweet side of the menu. This time I ordered the fresh fruit crepe. It was stuffed to the brim with fruit and granola. Again, it was a giant mess to eat- but it more than made up for that in deliciousness. The summer patio season was back in full swing after a brief week-long hiatus. We walked by Black Bull Tavern, scoping it out as a potential back-up if Java House was full. We did not anticipate the Java House patio being closed, it was sunny outside and t-shirt perfect weather!! After we were informed that the patio was not open, we abruptly turned and left, backtracking to Black Bull. Cheap drinks would have to wait, we were headed to best patio to bike to. Not that I really see why it is best patio to bike to. That easily goes to Against the Grain which is right on the waterfront. But who am I argue with an excuse to drink on a patio? Even if we did not have bikes to lock up. Our dinner plans remained unchanged: bar food. At the last minute I changed my mind from wings (which was what I had planned on getting at Java House) to the calamari, the craving just hit me out of nowhere. It is a good thing I did, because the calamari was outstanding!! I was expecting greasy bar food, not something to write home about! The calamari were seasoned to perfection and slightly spicy, the red pepper sauce added some more spice. The drinks were another story, nothing special on the menu and so I caved and ordered cocktails. The first one, a Tom Collins, was neon green and bright. The second drink, Purple Haze, was about the most unnatural shade of purple in existence. They were both excellent drinks and just what I needed, as we were sitting in a very sunny (and therefore hot) spot on the patio. Afterwards we decided to go to Bang Bang ice cream (an offshoot of Bakerbots) because apparently the ice cream is amazing and they make wacky sandwiches, using macarons, donuts and other such baked goods instead of regular cookies. I was sold. On the way we walked by Java House, just to see if maybe, just maybe, the patio was now open. Much to our surprise (and confusion) the patio at Java House was indeed open. Maybe it opens after 6pm? Who knows. Having been voted best cheap drinks patio, Java House certainly lived up to that. $3 and change for a mimosa that was made with Bambino? Cheap. We did not last very long on the patio. It may have been a combination of factors: lousy people (both on the patio and passing by) and the aforementioned confusion about the patio being open, but we were glad to finish our drinks and leave. We did it, we had cheap drinks on the patio, and now we will never go back there again. Turns out we had declared it the summer of patios too soon. Spring was back and with a vengeance. It rained for a few days, we thought surely it cannot rain for a third day in a row? It didn’t. But it was cloudy and cool- enough to scare people away from Java House’s patio? We thought so. We are down to the last few patios on the list– the popular ones on Queen West. The cool weather and ominous rain clouds did not just scare patio patrons away. It scared the restaurant owners away too. The patio was closed. No worries we had a few back-ups. As we walked towards Roncesvalles I had a brilliant idea: why don’t we try going to Electric Mud??? Enough time has surely passed that it won’t be crammed full! Grand Electric was packed as ever, this made me nervous. What I had not anticipated was Electric Mud being closed on a Tuesday. Who knew. Back to our Ronces plans! On the way we passed Mabel’s, Brent did a double-take and we backtracked a few steps. Apparently they have the city’s best granola. We walked in and could not find it. As I was paying for a pecan square, I noticed granola bars by the register. As we turned to leave, Brent found bags of granola. We had walked right by them when we came in. Oops. The granola bar was amazing! The granola was more roasted than what I was used to, but not overly roasted. It had a nutty and caramely flavour that was to die for. I fear I will eat the whole bag of granola in one sitting. As we neared Cafe Polonez my eyes nearly bugged out of my head. Ed’s Real Scoop had opened a second location! And they had piernik flavoured ice cream!!! Dessert plans were settled. Cafe Polonez was voted best perogies. I had eaten there before, and other than homemade, yes they are amazing perogies. You can order them in batches of 6 or 12, so it is easy to try a few. Brent almost ordered the pork schnitzel dinner. Until I warned him about the enormous dinner he was about to get. Polish people love their food and give generous helpings. I’d seen the dish before, my mom ordered it and remarked on how much food it was. Thankfully they also offer a pork schnitzel sandwich. We settled on 6 meat and 6 potato and cheese perogies. It was a close tie, to order the cabbage ones instead of potato and cheese. But Brent made a face when I mentioned that they have mushrooms. Fully satiated and with just enough room in our bellies we walked a few doors down to Ed’s. I was unbelievably excited. Ed’s! Ice cream! Piernik! Piernik is about the Polish equivalent of gingerbread- but better. I forgot that you can get two different ice cream scoops per serving at Ed’s. To match the piernik I ordered coffee-toffee. The ice cream connoisseurs at Ed’s do not eff around. The coffee ice cream tasted like coffee. Like an actual cup of coffee- no fake sweetness. The piernik ice cream won out. Easily the best scoop I have ever had. My legs are dead now. We walked god only knows how many kilometres (Brent says 16, I say a bajillion). We have cleared out most of the places near us and will have to start venturing out further via transit. P.S. : I had that pecan square the next morning and nearly fell out of my chair. It was unbelievable. Think butter tart but less sweet and instead of the pastry tart a chewy blondie. Turns out I’m no spring chicken. Remember back in the day in your early 20s when four cocktails wouldn’t even faze you? Those days (along with my metabolism) are gone. Oh how I miss them. Patio season is upon us, and what’s a patio without a drink? We tried to start the evening out right. The plan was to go to Fahrenheit for the best americano to start us off. Alas, we got there just after 6 and they had just closed. On to our next destination! There were clouds looming but thankfully no rain called for as we headed to the Ritz Carlton. The patio at DEQ was voted best patio for tourists, and who are we to argue? The patio afforded an interesting view of the CN Tower. However we had been expecting a rooftop patio with a skyline view. Ah well. It was mostly good, save for the annoying bagpiper a few blocks away. We were the only ones on the patio, so we chose the best seats: comfy couches. We opted for a cheese plate and to have dinner at our next stop, the best hotel bar. The cheese plate was a risk and only one of the three cheeses was good. I have learned my lesson: unless you know what types of cheeses served or if there is meat alongside it, avoid it. The first drink I had was made with tequila (in honour of Cinco de Mayo of course). And it had a giant frozen ball in the centre. While I waited for it to melt (after I had stabbed it apart into little pieces), I ordered a coffee-based drink. As I said before, I am no spring chicken. Coffee was needed. I felt rather out of place at the Library Bar at the Royal York Hotel. It was super fancy and very ritzy-ditzy. Luckily we totally looked like tourists, so it turned out fine. Continuing my pseudo-Cinco de Mayo celebrations, I ordered a Margaret Atwood margarita. I have no idea what the connection is, but I do know it was an oddly pink drink and very delicious. The menu was limited and so I stuck to basics and got a bison burger. It was a hefty burger, almost as big as my head. Needless to say it bested me. I wound up forgetting it on the stairs when we got home, having placed it down while I took my shoes off. And there it sat all night, as I had completely forgotten about it. Blame the four cocktails. We had been to Wanda’s Pie In the Sky twice already, both times the best cheesecake in the city had been sold out. Daaaaaamn it must be good I thought to myself. No more messing around. We would head out there as soon as I woke up (I always sleep later than Brent, always)… and managed to pull myself together. No surprise we got there at 11:30, I was slow to get ready. In my defence it was a Saturday morning. We had a secret-secret back-up plan if the cheesecake were sold out again (what are the odds, really?). Thankfully, hidden amongst the drool-inducing pies there was cheesecake!! Lucky for us, there were two slices left. 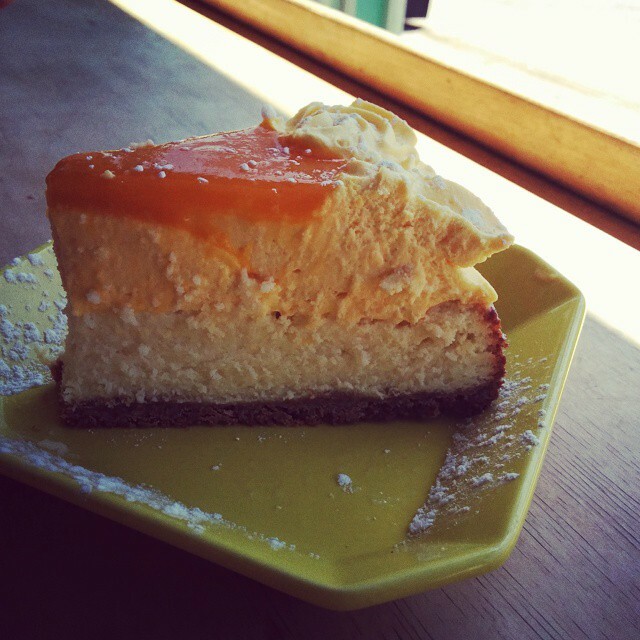 I am not usually a huge fan of mango, but sweet-mother-of-god this mango cheesecake was amazing. The cheesecake was so light and fluffy, the mango mousse on top was heavenly. Most importantly it was not too sweet or too rich. Usually with cheesecake I find that by the end of one slice I am halfway to a dessert-coma and cannot fathom ever eating cheesecake again- or anything for that matter. Not so with Wanda’s, it was so light and perfectly made. I kind of wish though that it had been sold out, a whole cheesecake would have been nice. But then I would have eaten way too much and hated myself for it. It is finally springtime here in Toronto, which means we are but one season away from my favourite: SUMMER!! And the warmer weather means that another season is upon us: patio season!!! There is just something about sitting outside, in the fresh air, fending off bees, that makes fooding all the better. We never finished off the list of best patios last year. I was extra psyched about our first patio outing for many reasons. We were celebrating that I have been accepted to the Book History and Print Culture collaborative program at U of T. We were going to (finally!) go to Queen Margherita Pizza on the way. And we were going to stop in at Wanda’s Pie In the Sky in Kensington Market for the best cheesecake. All of this on the way to Cocktail Bar! What a day we had planned. Oh and we were going to get best salad in the city from The Goods. This one I was less psyched about as I vehemently oppose salad. Except fruit salad, that one is OK. Turns out cheesecake fever is hitting the city. Maybe it was the hype about being voted best cheesecake or maybe interest in cheesecake is on the rise (thanks to the new Japanese cheesecake place with multiple-hour-long line-ups). Either way, the cheesecake was sold out- again.. This was our second attempt. Up next was Queen Margherita Pizza. I was excited about this as I enjoyed the pizza from FBI Pizza, another of their operations. This was much fancier, a sit-down restaurant rather than take-away slices. In a moment of hunger, we wound up ordering two pizzas. Brent’s pizza looked like someone dumped a salad on it. On top of the pulled pork and onions was a massive pile of greenery. My pizza was much better: spicy sausage and cheese, can’t go wrong. The best part however was the crust. They easily have the best pizza dough in the city. Full of pizza we made our way over to The Goods for the city’s best salad. Thankfully for me, ever the salad hater, they also had smoothies. I had a bite of salad, but I was picky and so I purposely left out the tomatoes, carrots, red cabbage and other greeneries. I mostly just ate some quinoa and tahini salad dressing. The smoothie was delicious, it tasted like liquid carrot cake crossed with spicy hot chocolate. It sounds weird, but it was delicious. We sat in the park finishing off our food, realizing it was a good thing that the cheesecake had been sold out. We were stuffed as it was. Our last stop of the day was Black Hoof’s Cocktail Bar. From the street the patio looked small and I seriously questioned why it had been voted one of the best. Glancing over the menu I quickly understood why. It was not so much about the patio itself (which was ok, it was kind of small though). It was about the epically amazing drinks menu. They really do live up to the name Cocktail Bar. The drinks were artfully crafted and delicious. We tried both their takes on traditional cocktails as well as some original ones. The menu was far too long to stay there and try all the different drinks. I felt so fancy sipping my special cocktails on the patio. It was an amazing kick-off to start the warm patio season.